Norfolk, Suffolk and Cambridgeshire will have to accept the introduction of a directly-elected mayor if they want to benefit from a proposed devolution settlement, a government minister has said today. But communities secretary Greg Clark insisted authorities would not be forced to take part in the initiative and maintained he was confident an agreement could be reached. Mr Clark’s comments came during a visit to Wisbech, which is one of two areas where new garden town developments have been proposed as part of the draft settlement outlined in the Budget two weeks ago. The document, which was signed by more than 20 council leaders from the three counties, outlines proposals for an annual £30 million infrastructure budget over 30 years, plus a further £175 million for housing. But, since the announcement, there has been growing unease both about how the new arrangements will be funded and the plan for a directly-elected mayor to be chosen in May next year. Speaking after talks with political and business leaders, Mr Clark said the money in the plan was additional money for the region that was currently held by central government departments. He also stressed that a deal would not be imposed on councils that did not want to take part in it and would not affect services currently offered by county and district authorities. But, asked whether the mayoral part of the deal was non-negotiable, Mr Clark said: “It is for the funding that would be devolved. “What we have got is over £1 billion currently in Whitehall departments. You can’t devolve that level of funding, and more to come, to a committee of shifting membership with all the uncertainty that entails. 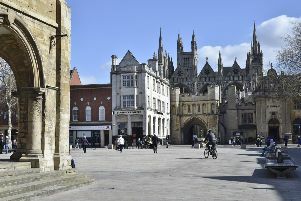 However, Steve Count, leader of Cambridgeshire County Council which last week backed a motion describing the deal as “unacceptable” in its current form, said the mayor was one issue that he had been asked to negotiate on by his authority. With the first mayoral election planned to take place in May next year, authorities in the region have until the end of June to complete a detailed agreement on the project. Mr Clark said: “There’s a lot to do, but, for all the difficulties of getting everyone in the room to agree the proposals, it was very important to do that, because that money is now in the budget. “If they hadn’t done that, it wouldn’t be there.